I try my best to always send up thankful, grateful and praising prayers. I believe this is the main reason I have a somewhat HAPPY outlook on life. I know that praying is not just a one way street. God constantly reaffirms that to me through the everyday blessings of life. He allows me to see things, hear things, read things, talk to people, share with others and do things that makes me vividly aware that HE IS REAL. If you ever ask yourself “WHY do I pray?” …then I think maybe you don’t pray enough OR you don’t look for the blessings that follow. START LOOKING! They are there. Want an example? I’m on it! 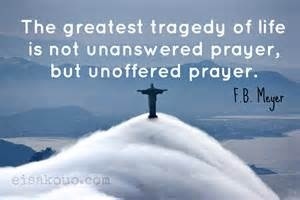 This is just ONE example of how prayer works! One of my friends asked for me to pray for her husband who was not in church and not saved. She had been praying for him forever and was just reaching out for others to do the same. I went home and wrote his name in my prayer journal. I prayed for his eyes to be open and know that he is God’s child. I specifically prayed for his salvation. About three months later, I was invited to this friend’s church by a different friend. Seriously, just got invited on that same day and decided to go like a few minutes before we left to go. As the service went on, it was a great message and such a blessing. Then, I realized that my friend’s husband was there. I thought, “HOW COOL!” The service was kind of winding down and the preacher said he had an announcement and my friend’s husband came up to the front of the church. HE ANNOUNCED THAT HE WAS SAVE! And got baptized that night! God knew I needed to be there to see it. I was so full of joy and felt so honored that God allowed me to see prayers truly work. You may think that was coincidence, but I don’t believe in coincidence, I BELIEVE IN BLESSINGS! God did that for my friend, her husband, their family and church… and even for me. PRAYER WORKS! So when you wonder if prayer works or you are getting antsy as to when those prayers will be answered—remember, GOD’s timing is perfect and you should just KEEP ON KEEPIN ON PRAYING! Attitude, Blessings, I love God!